Shred Size: 3/16" x 1-1/2"
Dimensions (HxWxD): 36.5" x 24" x 18.5"
The Swingline™ CX25-36 cross cut shredder complies with TAA agreements; making it suitable for government purchasing. 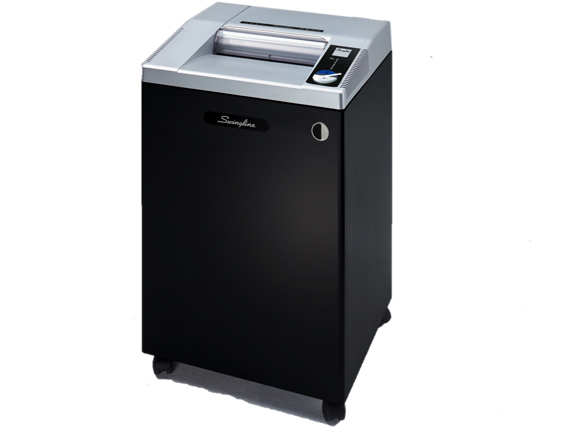 The Swingline™ shredder shreds optical media, paper, credit cards, staples, and paper clips. The Swingline™ CX25-36 cross cut shredder is part of the Swingline™'s Jam Stopper® shredder family; automatically reversing in case of paper jam. Thanks to thermal overload protection, the Jam Stopper® shredder motor doesn't get hot. The Jam Stopper® shredder will shred continuously without the need to cool down. The Swingline™ CX25-36 cross cut shredder features a wire-frame waste bin; when the bin is full, it'll be indicated by the bag full indicator. Cut Size 3/16" x 1-1/2"